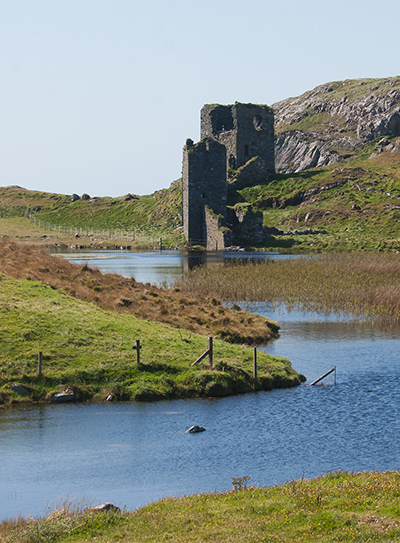 Dun Lough castle, Dun a Locha, the fort of the lake, is perched on the edge of 100 metre cliffs on the western headland above the Mizen Head. It is the oldest of the O’Mahoney castles, built by Donagh na Aimrice O’Mahoney, Donagh the migratory, in 1207, soon after the Norman invasion. A scholar and traveller on pilgrimages to the Holy Land and renowned for his generosity, Donagh erected this structure on the site of an ancient Celtic promontory fort. The castle consists of three towers, hence the title “Three Castle”, connected by a rampart wall of some 20 feet in height; one of the highest medieval walls still intact in Ireland. These walls run from the edge of the cliff, connecting the three towers eastwards to the lake. They then continue as a fortifying barrier along part of the lake on the northwest edge, continuing at the eastern end of it down to the cliffs on the northern face of the peninsula. 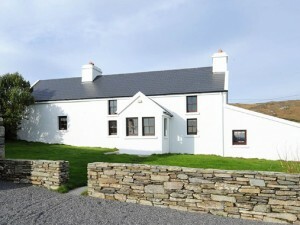 There are 40 acres behind the castle known as the “Island” which rise sharply creating an impregnable stronghold with a spectacular view of the surrounding land and sea from Mizen Head to the Beara peninsula and beyond. This provided an important tactical vantage point, from which all sea traffic could be observed and perhaps taxed, as well as ensuring maximum defense from all directions; ideally positioned as a last bastion against the Normans and attack other chieftains in the area including the invading armies of Mountjoy, Boyle and Cromwell. The easternmost tower by the lake was three stories high, comprised of a main arched entrance gateway and a spiral stairs. The middle tower was of similar height, also with a spiral stairway, still intact, and an interior archway at ground level. This led either to a separate room below or was the entrance to a souterain leading to the sea, utilizing the natural crevices in the rock. The largest tower; the dungeon on the westernmost end of the ramparts is approximately 10 – 15 metres in height, of three stories and about 5 metres square inside. The ground floor has several loophole windows and depressions in the walls which were possibly used for storage spaces. 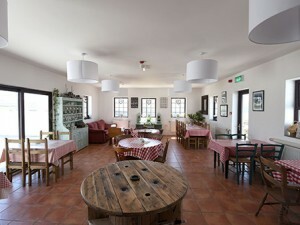 It was covered by a wooden ceiling, supported by beams from which the interior stairwell commences. Above this second level are two arches which support the stone ceiling that is the floor of the uppermost inner chamber. There are four corbel stones above this that provide support for the roof which was possibly slightly gabled and constructed of wood. Around this were the uppermost ramparts for observation and defense, the highest point of the castle. Against the rear walls of the tower and ramparts were lean-to structures, evident by the regular indentations in the stonework. The construction technique used for three castle head was of dry stone masonry; no cement or lime were utilized, but rather a mixture of the local “blue till”, a residue of the indigenous schist-slate rock found here. The geology of this area being metamorphic provided stones that were relatively flat and regular. They were not cut, but employed as they were, and quarried from open pits here on the land. Many legends abound concerning the “Three Castles”, not only because of its haunting atmosphere and the desolate stillness of the lake, but as well due to its violent history. The last family to have allegedly resided there were the O‘Donohue’s, all of whom apparently died tragically in suicide or murder. A drop of blood supposedly drops daily in the tower by the lake because of this. ome claim that there also exists an enchanted white “Lady of the Lake”. If one sees her then one will die imminently, according to the stories. Others maintain that gold lies hidden in the lake, the bottom of which has never been found, with buried treasures below the castles that if discovered bring only misfortune.